THIS year, St Patrick’s National School – formerly Newbridge No. 2 School – is celebrating 150 years of serving the community of the Kildare and Newbridge Union of Parishes and the wider community. To commemorate this very special year, the school has organised lots of events. 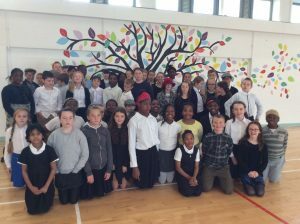 Recently there was a prayer service in St Patrick’s Church hosted by Reverand Tim followed by the unveiling of a piece of artwork in the school PE hall of two trees illustrating the surnames of all pupils and teachers, past and present. There was a slice of birthday cake “for everyone in the audience”. To give the children a taste of life 150 years ago, the school went back in time. Children and staff all dressed up as in times past. Teachers used blackboards and children experienced sitting in the old two-seater desks. The children played old-fashioned games such as conkers, marbles, pennies, blind man’s bluff and Mrs Brown. It was a fun and memorable occasion for all. The old roll books dating back to 1887 were also on display and traced back three generations of families who attended the school. It was discovered that the oldest living past pupil is Mary Young of Young’s Chemist. St Patrick’s Church of Ireland school first opened its doors on the 8 October 1868 on a site behind ‘Cutloose Hairdressers; on Henry Street adjacent to Limerick Lane. There were 29 pupils on the roll, 14 girls and 15 boys. The school hours were from 10am till 3pm. In 1886 the school moved to a site on Lower Eyre St, down beside The Winning Post. The building is still there today, a small house set back from the road with a wall and railings. The ages of the children attending school at that time ranged from three to 16 years. The school’s most famous past pupil, Kathleen Yardley Lonsdale, attended the school in 1907 before moving to Essex, England in 1908. Her father was the local postmaster and her house is still standing on the corner of Eyre Street and Station Road with a plaque in her memory. She gained world renown as a scientist, particularly as a crystallographer. There are buildings named in her honour at the University of Limerick and at Dublin City University. In 1923 the school moved to its third location, a building where Chicken America now stands today. The building was a former Wesleyan House for soldiers and civilians in the town; it served meals and had recreational facilities. When the British Army moved out in 1922 it became vacant. In 1942 Miss Beryl Graham arrived as principal and stayed to teach and guide the children for the next 42 years. She retired in 1984 after seeing the school through a new build and a move to its current location in Morristown in 1972. A new classroom was added in 1984 making it a three-teacher school. In 2006 the school received a new extension and was refurbished and modernised, consisting of five classrooms, a PE hall, library, two resource rooms and an office. Four years later in 2010, another extension added three classrooms and a staffroom. All building projects were funded by the DES but there was great support from the parent body to raise funds to support furnishing and equipping the school with IT and educational equipment. The school has come a long way over the last 150 years. Today they are 200 pupils in the school and a staff of 22 people, consisting of 13 teachers, 6 SNAs and a secretary, caretaker and cleaner. St Patrick’s is an active and vibrant school where children have the opportunity to participate in many extracurricular activities. The U11 girls are still elated at having recently won the camogie blitz in Scoil Mhuire. Other activities include debating, chess, coding, basketball, soccer, hurling, Gaelic football, table tennis and cross country. Every December, the school goes carol singing in the Whitewater shopping centre and perform Christmas plays to raise money for charities. St Patrick’s are working on earning their fifth Green Flag – biodiversity. Over the summer, with the help of parents, the school has made a sensory garden where children are planting both flowers and vegetables. Principal Joe O’ Connor says that “this is a very special year for St Patrick’s and hopes that the school will continue to serve the community for the next 150 years”.